The Westria series is the creation of Diana L. Paxson. The first novel she ever managed to finish was about Westria, and ten years later the first book in the Chronicles of Westria was the first book she actually sold. Since then she has revisited the Golden Land in between forays into other times and places, and will probably continue to do so as long as she can see a computer screen. Diana has written or collaborated on more than a score of books, including a number of historical fantasies set in Dark Age Europe and most of the Avalon books (for a full bibliography see diana-paxson.com), and has founded or otherwise instigated, midwifed, or re-written several organizations religious or otherwise. She lives in Berkeley (“because there, we wouldn’t be the weirdest parents at our kids’ school”) in a rambling house called Greyhaven with an arbitrarily variable number of people, cats, and non-corporeal entities in for a cup of tea. I was born in Detroit, Michigan in 1943, but my earliest memory is of arriving at my Aunt.s house in Los Angeles when I was three, which makes me, if not quite a native Californian, the next thing to it. I grew up in Pacific Palisades, where I spent most of my free time reading, drawing, and hiking in the Santa Monica mountains. I wrote stories as well, and had fantasies of writing and illustrating childrens’ books. Summers were spent at Camp Trinity, located in the mountains between Redding and Eureka, which I absolutely adored. We rode, hiked, built things, and swam in the river. I managed to pay attention in class enough to get in to Mills College, one of the best choices I ever made. After feeling like an alien throughout grade and high school, at last I had come to a place where books and ideas were valued. The friends I made here were for life, and the world to which professors like Dr. Elizabeth Pope (author of The Perilous Gard ) introduced me became my own. I majored in English with a French and Art minor and had a wonderful time. I also took Creative Writing. Although I learned a lot about structure and style, unfortunately the fashion was for literary fiction and “social realism”, or what I came to call the “ashcan school” of fiction. It bored me then as it still does now. As a result I came out convinced that I couldn’t write anything that anyone, including me, would ever want to read. It was not until I got to know Marion Zimmer Bradley that I realized there was another kind of literature that real people both wrote and read. Having decided that Northern California was my true native land, I continued on to graduate school at the University of California in Berkeley, where I got a Master’s degree in Comparative Literature with an emphasis on the Middle Ages, and picked up a teaching credential. In my last semester there I got the bright idea of throwing a tournament in my backyard, an idea which unexpectedly took root and turned into theSociety for Creative Anachronism. As a result, I married Donald Studebaker (who writes as Jon DeCles, among other pen names), had my first child, and spent much of the next ten years living in the Middle Ages and learning more than I ever wanted to know about organizational development. For the story of how all this led to the first Westria book, see Origins. The same year I started writing about Westria we all moved into Greyhaven, which has become something of an institution in its own right. Eventually, not only my husband but I and my brother-in-law Paul Edwin Zimmer started getting published, and Greyhaven turned into a cross between a manse and a writers’ colony. The family, like the stories, has grown. My son Ian now has three children of his own (one of whom makes a cameo appearance in The Golden Hills of Westria ), and is becoming a writer himself. Along the way I worked for ten years for the Far West Laboratory for Educational Research and Development (now WestEd), writing curriculum for Native American children and Environmental Education, and spent several years teaching beginning composition at two local schools, Chabot College and Cal State Hayward, now part of Cal State East Bay. I also ended up founding the Fellowship of the Spiral Path, and serving as First Officer of the Covenant of the Goddess and later as Steerswoman of the Troth and editor of its quarterly journal, Idunna . I spent several years as Western Regional Director for the Science Fiction & Fantasy Writers of America. 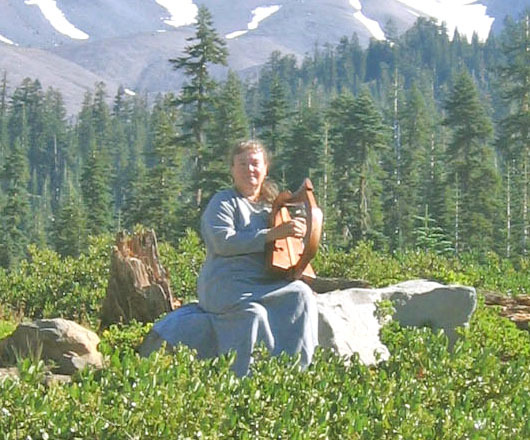 The author, with her harp Peregrine, at the future site of the College of the Wise.